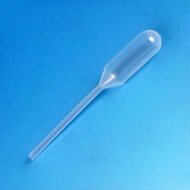 A package of twelve disposable pipettes (droppers) which draw up approximately 1 milliliter at a time. Unlike the 3ml size, these pipettes are not graduated. Can easily dispense 1 drop at a time. We recommend using a separate dropper for each essential oil. Review: Needed these to make wart remover for my grandson. They worked great!